In the Sjöhistoriska Museet (Maritime Museum) in Stockholm there is a model of a galleon that came from the "Great Church" in Stockholm (Storkyrkan, known as Stockholm Cathedral). The origin and date of construction of the model are not known. Only in a church inventory of 1830 there is an entry that "the rather old ship before hung beneath the organ loft." Unfortunately, the model is badly damaged, the rigging and parts of the cutwater and the rear galleries are missing. But the hull with many details of construction and the painting is preserved. The arrangement of gun ports and wales of the vessel's side and the location and number of decks are consistent with the rules and specifications of the old ship builders. Thus, despite the missing parts, the model can be seen as a rare historical document. When we visited Stockholm Cathedral in August 2015, we found a votive ship that looked like a completed and restored replica of the original galleon. Over the years I have seen quite a few votive ships in churches on trips in Northern Europe. I include photos of some votive ships that I recently found in Germany, Norway and Denmark. The pictures are from Århus Cathedral, Holmens Kirke in Copenhagen, Ålesund Church and Marienkirche in Rostock. There is a book by Peter Kirsch, The Galleon: The Great Ship of the Armada Era, Conway Maritime Press / Naval Institute Press, 1990, ISBN: 978-0851775463, about the naval development of the 16th century. The unwieldy carracks with their high forecastles and aftcastles gave way to the galleons with an elongated hull and lowered forecastle. They were faster, more maneuverable vessels. Kirsch's book is lively, describing not only the technological changes and advances, but also their advantages documented by numerous quotations from contemporary travelers and sailors. Many engravings of ships from the period are printed. In the appendix of the book is a reprint of an English treatise of 1620 on shipbuilding, the best preserved description of presentation and construction of a ship's hull of that time. That appendix is based on a publication by W. Salisbury, Society for Nautical Research, Occasional Publications No. 6, London 1958. 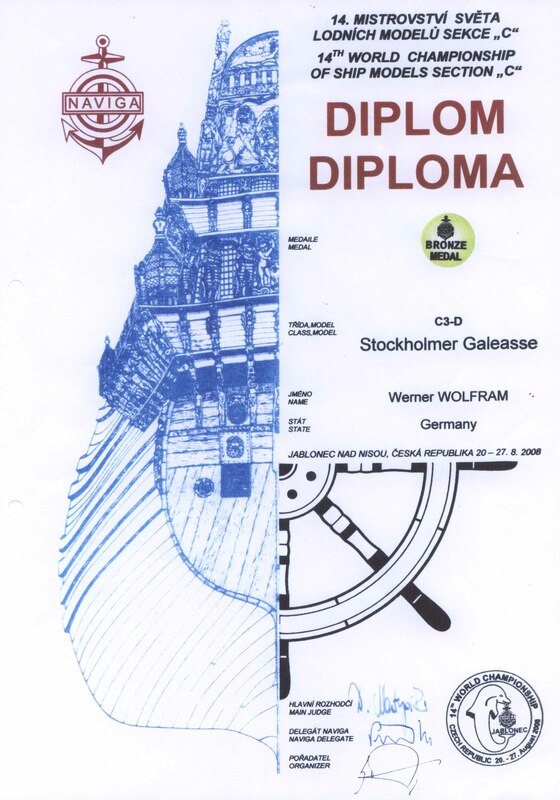 Included in the book are the plans of the reconstructed Stockholm galleon and photos of a model built by Kirsch in scale 1 : 35. Peter Kirsch dated the model of the Stockholm galleon to about 1600, by comparison with contemporary engravings. The model is a typical votive ship. It was specially built to hang in a church, and the church visitors should see the model from below. In this perspective a bulky underwater hull would interfere, so the model was built too narrow, as many votive ships were made. Therefore, for his reconstruction of the hull of the galleon Peter Kirsch referred to the English treatise of 1620. From contemporary rules governing the size and spacing of the gun ports he could derive the model's scale resp. the size of the original ship. The rigging he reconstructed from contemporary engravings. The original ship (if built according to the English treatise) had a length overall (with rigging) of 65 m, a length between perpendiculars of 39 m, a maximum width of 11 m and a draft of 4.5 m.
The rich decoration of the galleon shows elements of Christian and pre-Christian notions, that range from hell to heaven and include our world in between. As a ship on a long voyage was a world in itself. Of course an average merchant ship in 1600 was not as richly painted and decorated. The vessel that the Stockholm votive ship could have been modeled after was probably a large and representative ship, whose decoration and elaborate rigging went beyond what was common and necessary. The painting below the wales that looks very much like waves is most probably only a votive ship decoration, whereas the painting above could have been on the original ship, too. With this model, its builder, Mr. Wolfram Werner, won a medal at the 2008 World Championship of Ship Models in the Czech Republic. The model was built in 1 : 33 scale. He made it without sails to allow for a better view on the specific galleon type rigging. Galleons of this size had several boats, the largest of which, the longboat, could not be lifted on deck and was towed. The longboat of the galleon was modeled to the salvaged boat of the Vasa. 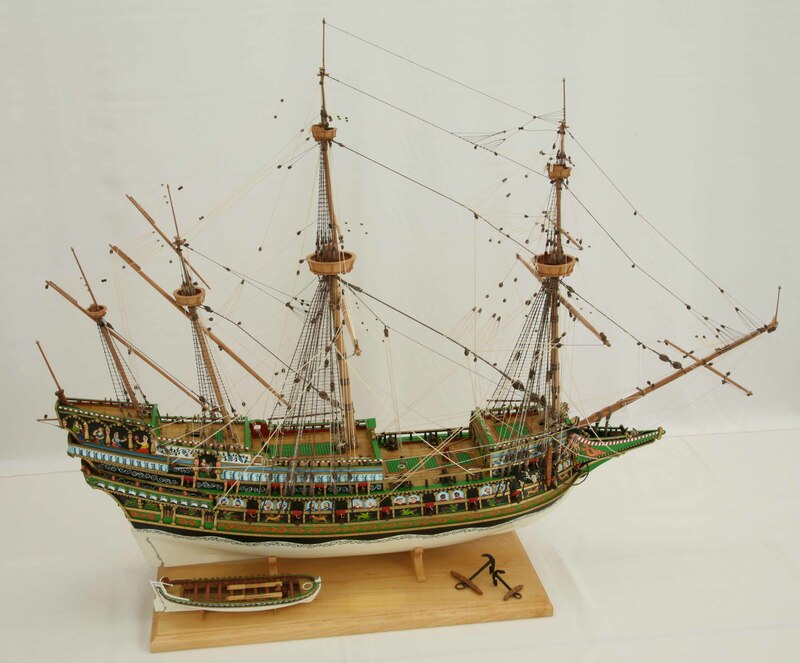 This model of the galleon is a very beautiful true masterpiece, showing fine details in the hull, the painting and the rigging. The ship model is 1 : 66 scale. Length is 95 cm, width 41 cm, height 73 cm. The longboat model is 22 cm. The galleon model can be taken out of the stand, i.e. for transport.